"Oh My God! There's An Axe In My Head." The Game of International Diplomacy is a board game of strategy, diplomacy, and absurd humor. 348 backers pledged $22,995 to help bring this project to life. Oh My God! There's An Axe In My Head. The Game of International Diplomacy is a board game of strategy, diplomacy, and absurd humor designed by David Fooden and Chris Adams. It's set in an alternate version of the first meeting of the League of Nations, one where things took a deadly-but-madcap turn for the worse. It also explains the reason for this meme. 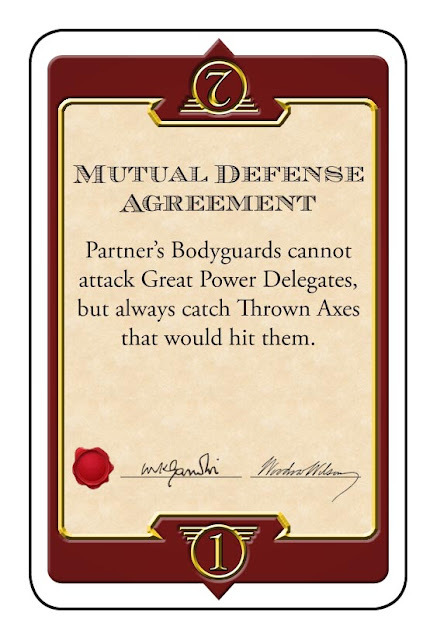 Any games that you get as a result of support on Kickstarter will come with EXCLUSIVE Action and Diplomacy Cards. The ONLY way to get these (until we release an expansion) is through Kickstarter support. Here's a sneak preview of the production art! What's that about a previous publisher? Bucephalus Games licensed Oh My God! There's An Axe In My Head from Chris and I back in 2008 but never produced it. We worked with them to create the artwork and were told over and over again—along with everyone who wanted the game, that it was coming out soon, but that date kept being pushed back. After two years of waiting, we took back the publishing rights and went our separate ways. Oh My God! There's An Axe In My Head was under consideration by another game publisher who gave us some valuable feedback on streamlining the game, but were uncomfortable with its title. We've taken some of their advice to heart and edited the game to make game-play faster and more exciting. 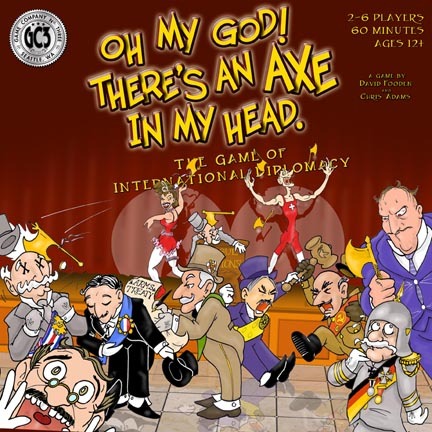 Inspired by the successful game projects on Kickstarter, Chris and I thought a Kickstarter project would be ideal to make Oh My God There's An Axe In My Head available and publish it on our own. We've published the CºNTINUUM: Roleplaying in The Yet™ and Chi-Chian role-playing games previous to this (and worked on many games for other large publishers), so we've got the experience to handle creating and publishing a quality game, but the high cost of manufacturing a boardgame was beyond our means until Kickstarter came along as an option. That's where you come in, dear potential supporter. We've put over six years of work into designing Oh My God! There's An Axe In My Head, spent months on the artwork and graphics, and playtested it hundreds of times at conventions since 2004 (and enjoyed the hell out of it every time). Pre-order your copy, get a great deal on a fun game, and enrich the creativity of the boardgame community by supporting indie publishers. What about the people who ordered the game from Bucephalus? We are not associated with Bucephalus Games. I've offered Bucephalus the opportunity to purchase copies of the game in bulk, at cost to fulfill any yet-unrefunded pre-orders they took. They've been unresponsive so far. Edit 8/30/11: We've been in touch with Bucephalus, and there may be a possibility of working with them to fulfill their old pre-orders. If there's any more info than that we'll be sure to post it here. If the Kickstarter project exceeds its goal and receives over $30,000 in pledges, we can afford to extend that at-cost offer, plus shipping, to individuals who placed a valid, unrefunded pre-order of Oh My God! There's An Axe In My Head with Bucephlaus Games. "I love this game. I played it at a con a couple years ago and I've been hoping for another opportunity for a while. It's all the fun and strategy of something like Catan, with the flavor text and kill-your-friends joy of Munchkin." "A lot of detail went into every aspect of the game, and every rule and minor element fits the humorous theme, as well as the vintage-style art. This is a quality game that is light enough to appeal to casual gamers, with enough strategic elements to interest the more competitive such as myself." "The positional play on the board, with the probability curve, push your luck mechanism, alliances & treaties, and special card play all blend themselves in a wonderful mix. …if you get a chance to play it then do so, but set aside some cash beforehand because you're going to be picking it up right after you play it. It is REALLY good. " "The artwork looks a lot like what would happen if John Kovalic and Winsor McCay made an art baby, which is to say it looks really cool. So check it out, pre-order a copy, and seriously, who wouldn't want to play a game called Oh My God! There's An Axe In My Head?" "This is a really great game, both in theme and execution. The designers have managed to capture the nonsense of post-World War I diplomacy with... axe throwing?" Customers in the U.S. will be sent the game(s) at no additional shipping charge. This includes Alaska and Hawaii. Shipping to Canada and the U.K. is an additional $20, Shipping to Germany is an additional $40. Please inquire about the cost of shipping to other countries. You can calculate it online, here. Also, please note that you may have taxes and or tariffs for importing games. Game Company No. 3 will not be responsible for these costs. A NOTE ON INTERNATIONAL SHIPPING—Customers in the U.S. will be sent the game(s) with no additional shipping charge. This includes Alaska and Hawaii. Shipping to Canada is an additional $20. Shipping to other countries is an additional $40. Also, please note that you may have taxes and or tariffs for importing games. Game Company No. 3 will not be responsible for these costs. ANOTHER NOTE ON INTERNATIONAL SHIPPING—A very smart fellow pointed out that not all International shipping is equal, so…shipping to Germany is an extra $40, shipping to the U.K. is an additional $20. Please inquire about any other shipping costs outside of the U.S.
MINOR DELEGATE—All supporters at the $10 level and above will receive a print-and-play pdf of the game, Translation Guide pdf, and desktop and smartphone wallpapers featuring art from the game. You will also be given special thanks in the credits of the rulebook as a supporter. BODYGUARD—One (1) copy of the game plus the exclusive bonus cards, with free shipping in the U.S..
TRANSLATOR—Two (2) copies of the game, 2 sets of exclusive bonus cards, with free shipping in the U.S..
AMBASSADOR—Six (6) copies of the game, 6 sets of bonus cards, free U.S. shipping and a promo poster. SECRETARY GENERAL—Help us launch our first game at this level and you'll get: A copy of the game and bonus cards, a Game Company No. 3 t-shirt in the color and size of your choice, GC3 buttons, a Game Company No. 3 LIFETIME PASS: that's a copy of EVERY game we'll EVER produce. We currently have five more game designs in the pipeline for the next few years, and plan on releasing 1-2 per year—possibly more than that in the future. You'll also receive exclusive insider updates and sneak peeks at projects we're working on, a direct line to suggest expansions and give feedback, and we'll illustrate you into a future game. The game's designers will give you a phone call or Skype chat personally thanking you for your support. We'll also host special events just for our supporters at this level and above at any game convention we attend. PATRON OF THE ARTS—A unique hand-crafted, deluxe version of the game featuring all hand-painted wooden pieces, with uniquely designed, gold-leaf detailed boxes and boards printed on archival art paper. These limited-edition pieces are signed by the games' creators and numbered—ONLY 10 of these unique objets d′art games will be made. Each will include an original sketch of a piece of art from the game. SOVEREIGN NATION— Just like the Secretary General level, but you'll get TWO copies of every game we release AND one of the games co-creators will hand-deliver your game and facilitate a catered game night for you and up to 5 friends—MUST BE LOCAL TO NYC OR SEATTLE/PORTLAND AREAS.